The game that began this madness. I'd like to assume we're all acquainted with this one - if not, that's what the gameplay page is for! It traditional cabinet boasts a paddle control for playing the game, though dipswitches and alternate setups allow joystick support as well. 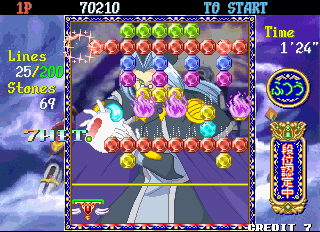 This version features the single-player Trial and Story Modes, as well as a 2-player Versus. 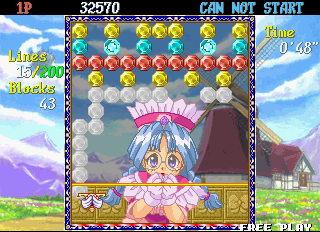 It is the only version of the game to maintain a set block layout in Story Mode no matter how many times you continue; all other versions will randomise after each continue. 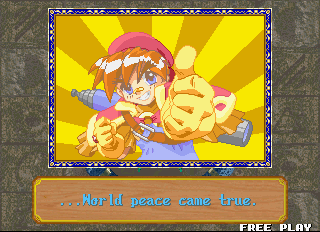 The game's region can be set from Japan, USA and World, but on any other than Japan you're missing out. 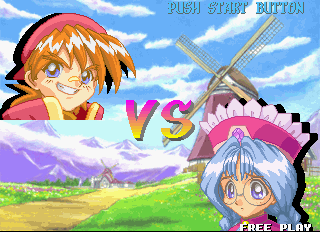 Episodes begin with the characters conversing and ultimately clashing in some form, but the English versions axe these discussions altogether, leading to floating heads just sliding into frame for no reason before matches. The endings are maintained, though are chopped down from two screens to one, resulting in less story and more non sequiturs. The gameplay remains intact, but the presentation is not. See the regional changes sub-heading for details! The unlock conditions are revealed if you complete the game in under 10 minutes. 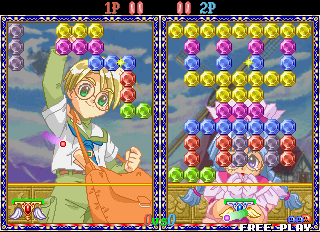 To unlock Patrako, first insert a coin (if in Free Play mode, just wait until the "how to play" sequence begins). Then press the "shoot" button 3 times. Press Start. Patrako will come after Rquo on the character select roster (despite appearing at the top of the screen). 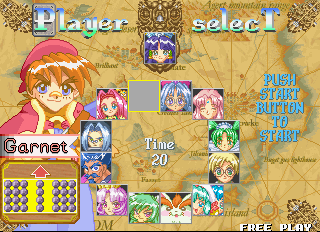 Each character has three palettes that are determined by what button you used to select the character. 1P colour = press "shoot". 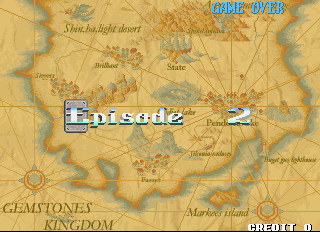 2P colour = press Start. 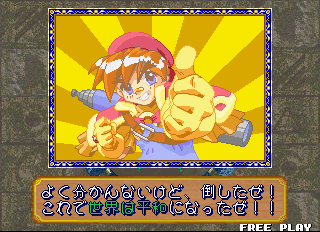 3P colour = press "shoot" and Start simultaneously. 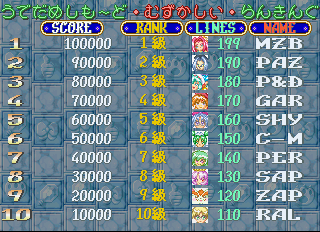 On the high score screen, enter a name from any of the default high scores (that is, any high score on the board when the game is at factory settings without any player-made ones) to make the character you chose speak. As far as I'm aware, it's no different than what they say in a regular match. 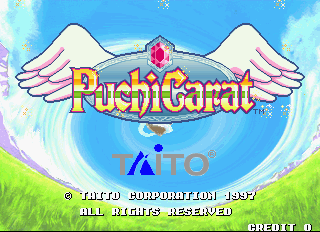 Released on July 28 2005 in Japan on the PlayStation 2, this is a compilation of 25 Taito arcade titles, one of which is Puchi Carat! ... as I don't own the collection, that's as much as I can say. Are there super special awesome bonus features included? Who knows! 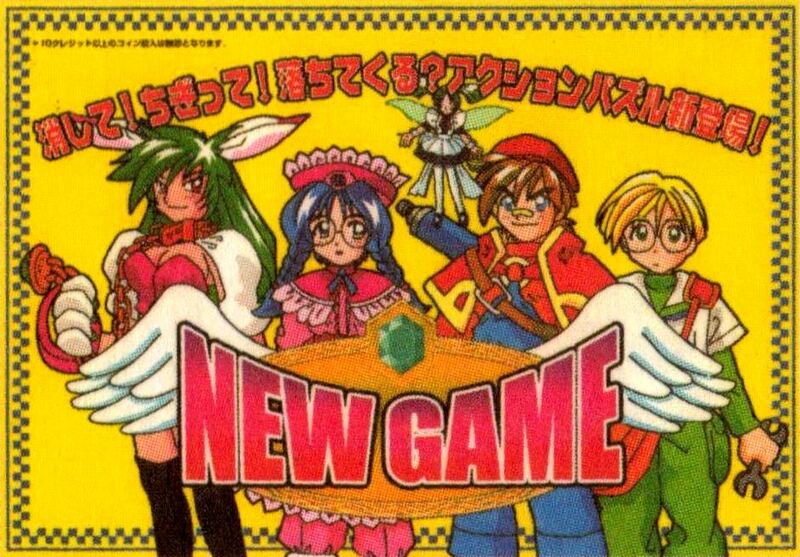 Released at end of March 2006 in Europe and Australia and May 16 2007 in America, this grabs games from both volumes of Taito Memories and packs them into one disc. This was released on the PlayStation 2, the Xbox (Europe only) and on the PC. 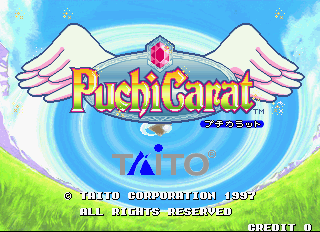 I wouldn't mention the game if Puchi Carat wasn't included! All games are automatically assigned to their European or American region settings depending on where in the world you bought the game, so that means no dialogue scenes and abbreviated endings (as well as quirks in other games). 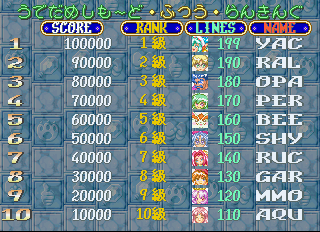 Still, it's the only legitimate means of playing the arcade-accurate game in the West, and it includes the frighteningly awesome Front Line, so it's not to be sniffed at. 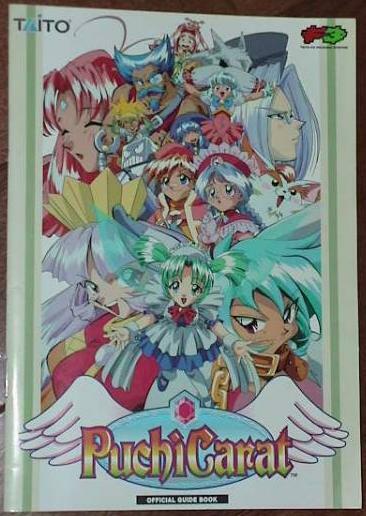 The Japanese version has a caption under the logo for those who can't read nonsense English words. 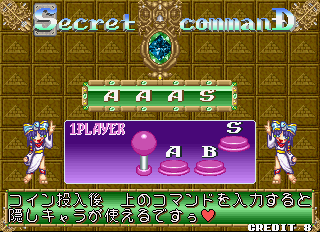 After the intro animation, "how to play" sequence and demo have played out in the attract mode, a screen highlighting one of the twelve characters and giving some details about them (transcribed and translated in the respective character pages) will show up. The English version axes them. 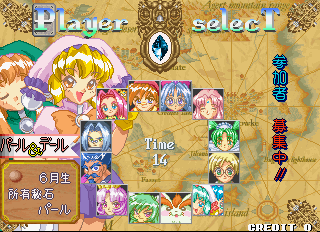 The menu buttons were translated, though the original Japanese still had English captions. 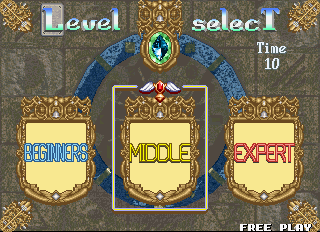 "Super Gamer" was changed to "Expert". 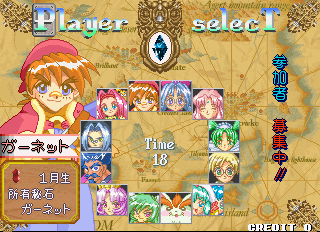 Upon choosing a character, the attack layout window changes to show the stone and month represented by the character. The English version chucks this out. 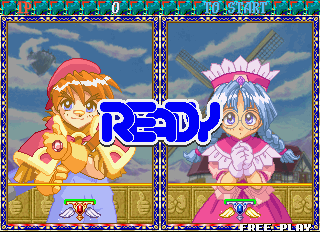 The heads-up display for Trial Mode is trimmed a little in the English version, the windows on the right side being hacked out. "Stones" is changed to "Blocks". The most prominent change from a story point of view - they've cut out all the bloody dialogue! Instead of conversing, the two mugshots slide in and just sit there in awkward silence, with only a "Versus" logo there to break the ice. Wonderful. The PlayStation version would reinstate this, though not without its own problems. And they dropped the post-battle dialogue, too. It just skips straight to the next Episode screen in the English version. 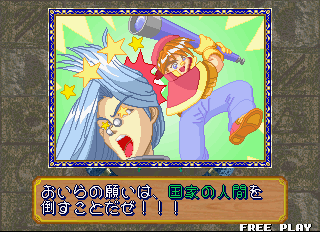 The PlayStaton version includes this, though. 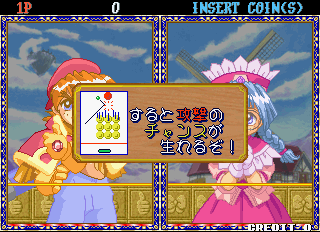 In all difficulties, starting a round in any mode will spring up a few instructions that presumably enlighten you a little on how the game works. 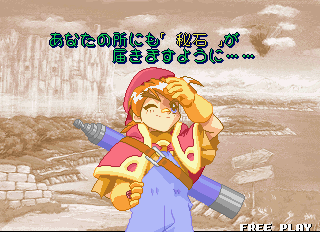 The English version removed these for all but the Beginners difficulty setting in story mode. 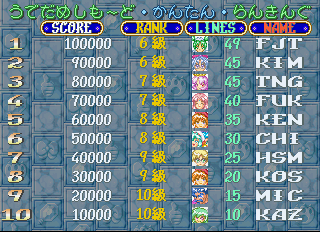 The Japanese has two screens for each ending, and then a short piece of text for the character before the credits roll. 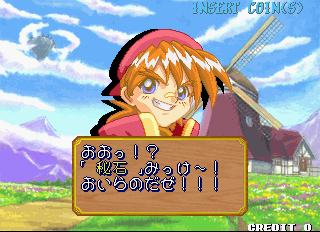 The English version reduces it to one screen and gives it entirely new text that often has nothing to do with the original text. 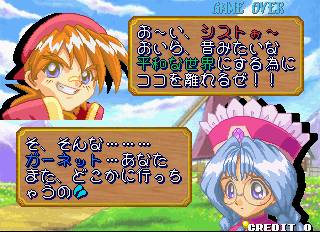 The PlayStation version restored both screens and translated the original ending text, though, uh, how accurate it was is debateable. The screen before the credits was not restored, though. 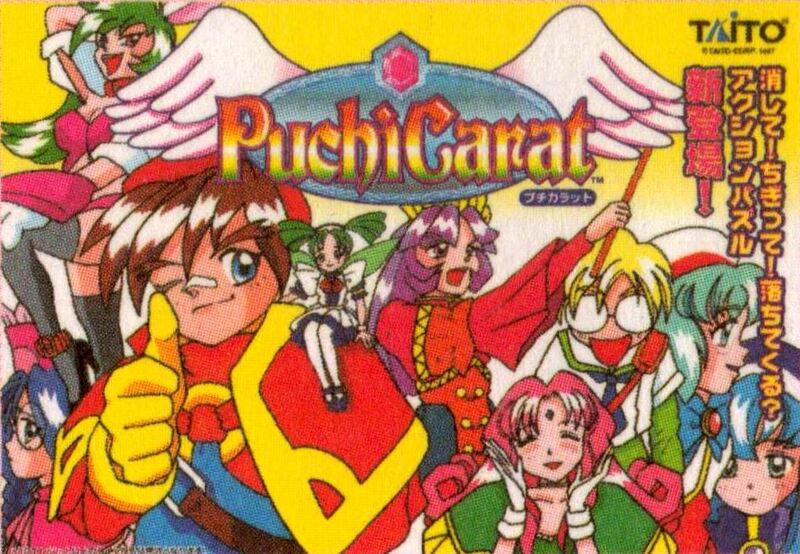 The Puchi Carat Official Guide Book came packaged with the arcade board and cabinet paraphernalia, and I can only imagine operators and players alike were free to read it in arcade parlours. 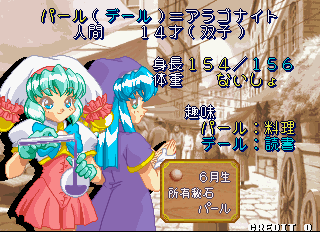 It is perhaps the most exhaustive source of info on the game, featuring an indepth backstory for both the plot and the twelve playable characters, as well as bonus gemstone trivia! Perhaps most interesting of all, the final section features preliminary flyer designs, and some quick details about the game's development and showing at expos. 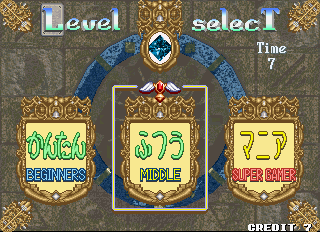 The earliest incarnation of the game used Cleopatra Fortune music as a placeholder, and apparnetly required players to fill a gauge before they could attack with a button press!